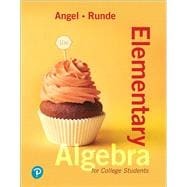 The Angel/Runde author team has developed a text and MyLab™ program that uses short, concise sentences and clearly laid-out examples to ensure that all students develop a true understanding of algebra. In this revision, the authors retain this hallmark clarity of language to build the foundation of understanding algebra, while revamping exercise sets and creating new MyLab Math resources to give students a comprehensive learning and practice environment. Angel/Runde offers market-leading content written by author-educators, tightly integrated with the #1 choice in digital learning — MyLab Math. Bringing the authors’ voice and approach into the MyLab course gives students the clarity, motivation, and understanding they need to master algebra. MyLab™ Math is the teaching and learning platform that empowers instructors to reach every student. By combining trusted authors’ content with digital tools and a flexible platform, MyLab personalizes the learning experience and improves results for each student. Dennis Runde received his BS and MS in mathematics from the University of Wisconsin–Platteville and Milwaukee, respectively. He has a PhD in Mathematics Education from the University of South Florida. He has been teaching for twenty-seven years at State College of Florida-Manatee-Sarasota. His interests include reading, history, fishing, trivia contests, and cooking. He and his wife Kristin are the proud parents of their three sons - Alex, Nick, and Max.